Critically acclaimed Soul singer Timi Dakolo and superstar music-man DJ Xclusive will bring Lagos alive on November 2, 2014, as they join comedian Gordons, singer Yinka Davis and a host of others for this love musical. The event is organized by Limitless Minds Africa in conjunction with Cool fm and Oracle Experience Limited. 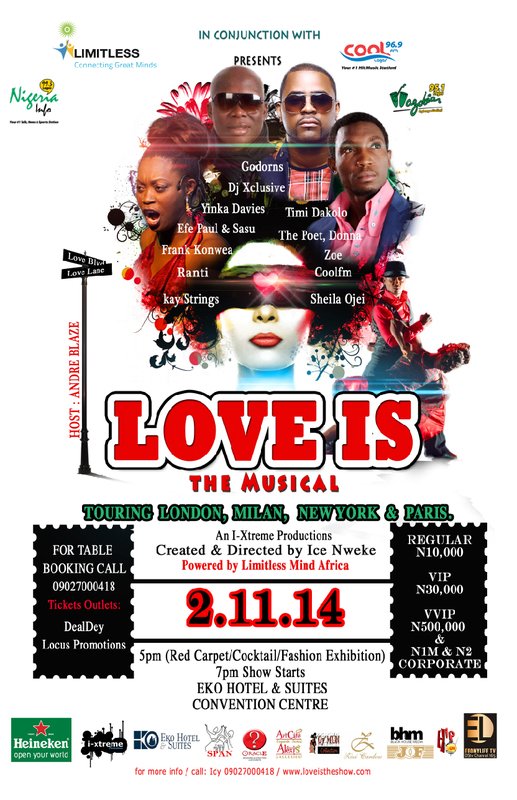 ‘Love Is…the Musical’ holds at The Eko Convention Centre, in Lagos on November 2, 2014. Additional highlights of the night will be special appearances from popular OAPs like Mannie and ZOE. To be hosted by TV personality Andre Blaze, the extraordinary show will showcase exhilarating performances from internationally trained dance professionals from around the world. The show is created and directed by Ice Nweke. The inspiring intimate story is a clear portrait of the lives of three beautiful women on a journey in search of the true meaning of love. Ice Nweke has successfully merged the world of Realism, Expressionism and Surrealism into one beautiful masterpiece on various stage globally. Produced by Clementine Vervelde, the musical is a richly textured stage production that captures the deep-rooted insecurity in relationships, which is currently spreading into the fibers of our society. Other special guest artists include Ranti Ihimoyan, Donna the Poet, Sheila, Efe Paul and Sasu, Frank Konwea and Kay Strings. According to the director, ‘the musical is a polished production, with classy costumes and stunning vocals. Advance theatre: Comic and dramatic, Sensual and lyrical, acrobatic, Romantic and ultimately inspiring dance moves’. Dance is often the best way to express your emotions and feelings; Love is the show is a combination of music drama and spoken words all in the endeavor to give a definition to the word love. Ice added. Love is…the musical will be an evening of amazing music, dance, poetry and the greatest of it all, LOVE.Critically acclaimed Soul singer Timi Dakolo and superstar music-man DJ Xclusive will bring Lagos alive on November 2, 2014, as they join comedian Gordons, singer Yinka Davis and a host of others for this love musical. Love is…the musical will be an evening of amazing music, dance, poetry and the greatest of it all, LOVE. FREE WORKSHOP! 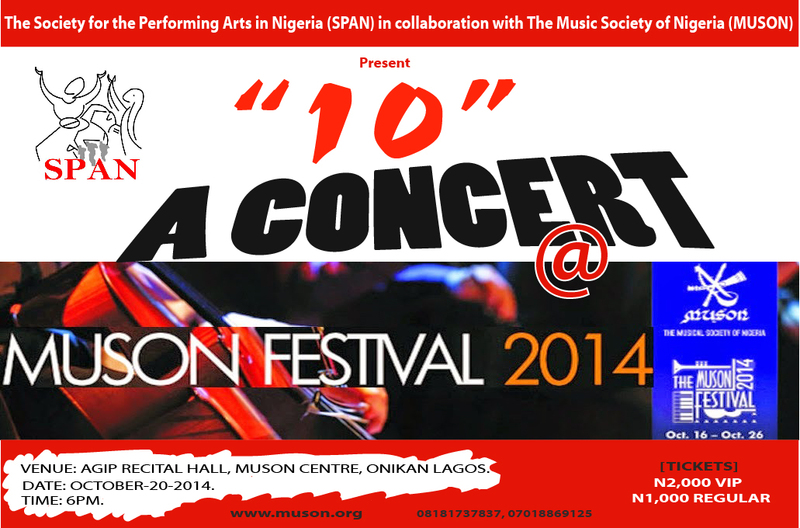 (MUSON) COMING OF AGE FESTIVAL 2014. The Society for the performing Arts in Nigeria (SPAN) in collaboration with The Music Society of Nigeria (MUSON), present a dance workshop in HIP-HOP, JAZZ and CONTEMPORARY. The workshop starts at 10am all the way to 2pm. We will be working on sessions of dance choreography in HIP-HOP, JAZZ, and CONTEMPORARY geared towards a production, titled “10” at the AGIP RECITAL HALL MUSON CENTRE ONIKAN LAGOS for 6pm. “10” is a mini production put together to showcase what SPAN is about and the wonderful experiences we have had over the past ten years. It promises to be amazing and entertaining. We are really looking forward to having other dancers be a part of this wonderful experience. Don’t miss out. Admission is absolutely free! World class music education in the heart of Lagos! World class Jazz, Contemporary and Ethnic music education in the very heart of Lagos! 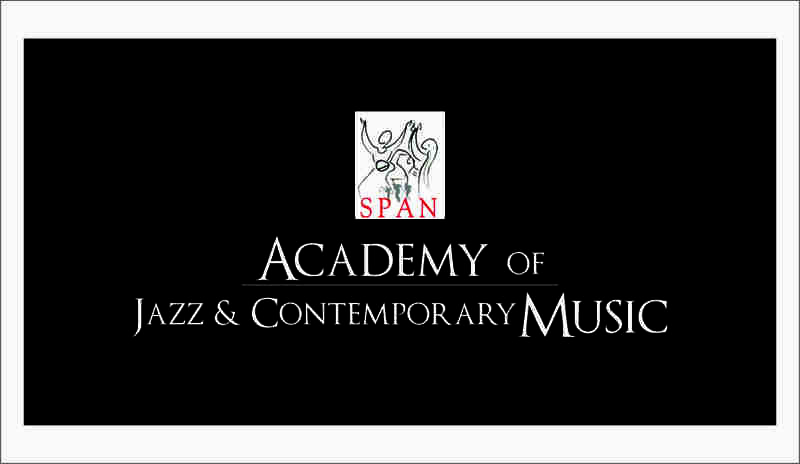 SPAN Academy of Jazz and Contemporary Music is now in the heart of Lagos with easy access from any location in Lagos. No 13 Davies Street off Broad Street Lagos Island. For more information please visit us at 13 Davies Street, off Broad Street, Lagos Island or call 017767726, 09091900700. WORKSHOP ALERT! 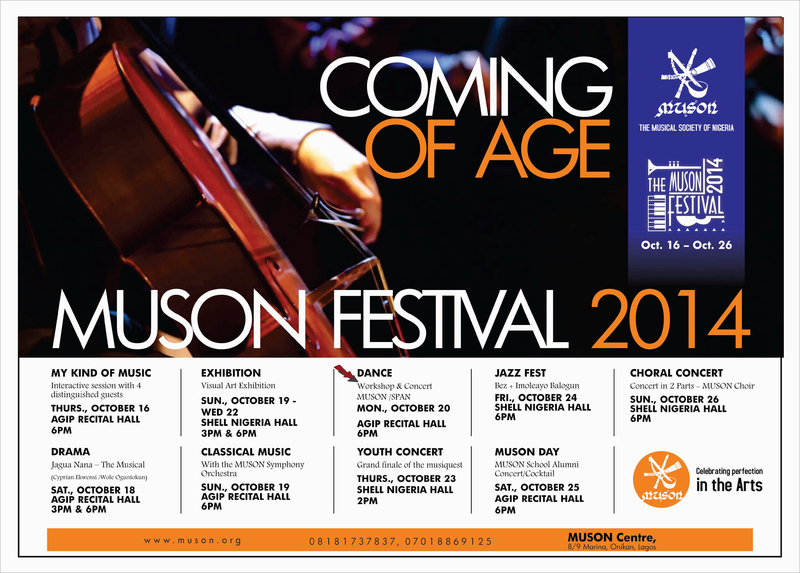 (MUSON) COMING OF AGE FESTIVAL 2014.